The Surface is an intriguing drama of two men with hidden turmoil stranded at sea. Both are strangers to each, and the reasons that led them to be stranded at that point is what makes the film an interesting look at what makes us tick and how we each deal with struggles. Mitch (Sean Astin) who is on his boat in Lake Michigan hits the debris of the airplane that Kelly (Chris Mulkey) was flying. When Mitch pulls Kelly aboard, Kelly's initial reaction is to pull a knife on Mitch. Movies that consists primarily of just two characters talking to each for the majority of the film is often challenging for the filmmaker to keep it interesting enough to keep our attention. 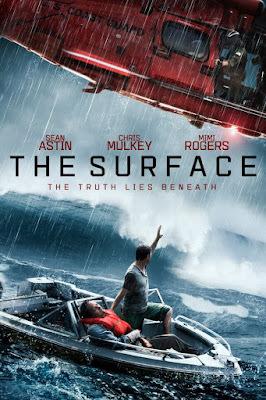 Unlike similar theme movies of being stranded like Life of Pi or Castaway, The Surface has less imaginative characters to entertain us with. However, what makes The Surface captivating are the strong performances by Sean Astin and Chris Mulkey who really work well off of each other. Hearing each other's back story, yes, the story does have flashbacks off of their boat, it is amazing how their circumstance has led them to this point. The story is a bit slow paced and lacking of action, so the film may not appeal to everyone. Overall, I would recommend the film with reservation. While the film is good, as I have said before, the type of pacing and material and lack of action in the film is just not for everyone. Despite the film being just about one and a half hour long, it felt a bit too long. While each character had an interesting back story, Mitch with his father and girlfriend, and Kelly with his family and mysterious flights, the dialogue and situation is stretched a bit thin. Fans of Sean Astin and Chris Mulkey and even Mimi Rogers should definitely watch the film as they were very good in their roles.